its on the rear on driver side. If i blow, the air goes out somewhere. without restrictions. Is it part of the cast and do I need a plug or something? of the timing chain. So far so good, but then, got that excentric thingy for the fuel pump, that is if i follow the drawings, bolted on with the cam bolt. but there is nothing that prevents it to rotate if by some reason the bolt would come loose. Is this normal or the propper way to add that thing? As I will place an EFI later on, I don't need it but thought, may something hapend, I may like be able to put a carb without opening the engine again. So question is, is it really the way it should be placed? The engine came with buckets of parts, nuts, bolts and gaskets. As I was missing the intake, the oil pan and exhaust ordered a full set. So got this Felpro set, also with head gaskets. I've open the other pack i was already having and compared them. Which one shoudl I use? they seams be as thick. Wondering if the Corteco, with the extra metal would go "flat" as the flepros..
either closed or very restricted. Both sets have same holes. On the heads the water passage do match. So question is, is it normal, or should I open them? I saw the cam needed go deeper. No big deal, except, I see the lobes ar enot matching the lifters guides. Added one lifter and its clear they are not aligned. On this pict, the chain is aligned with the lower gear, so as the cam can float, I wonder if I need to move the lower gear toward the front of the engine? The lower gear was still on the crankshaft. Or is there some kind of spacer I need somewhere? Also if I need to move the lower gear how do I do this? There is a, say 2 inches, long piece of metal on the crankshaft, I tried to tap it out, but I would not move. Do i need tap it with greater force and then only the gear would then came out, or do i need extract the gear a bit and it would be guided by this little metal part? From what I can see on lobes, it looks like i would need to have the cam bit forward by say a 1/4 of an inch, 5 or 6mm. Just found these regarding my q #5. I've also seen some lifters are more off than others. Man this is a scary engine, gimme a cleveland! 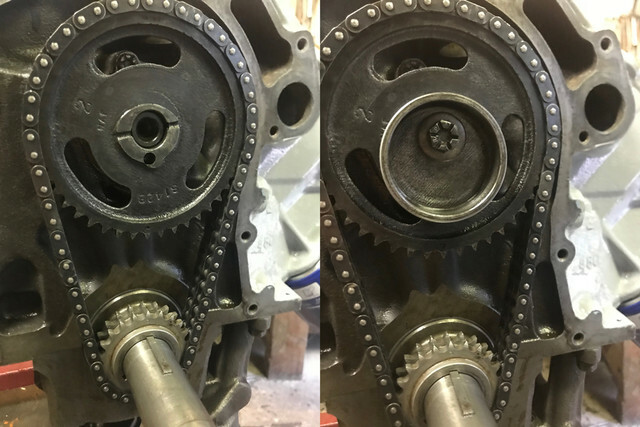 For #2, a cleveland has a small bits of metal(pin) that goes into the timing chain, and once tightened, it won't move. The ORIGINAL 429 has a smooth surface no pin (the one on my picts). "The ORIGINAL solid 1 piece fuel pump eccentric did not have a dowel pin hole; (it was glued to the calm gear with a contact cement. Heat and time usually broke down the glue)." so it is wise to let it on knowing i will use an EFI? and should I add a washer of equal thickness if I remove it? Or would it be wise to get a newer version and install it anyway in case the weight is somehow taken in account in cam assembly and would somehow create vibrations if I remove it completly? #2 - Usually there is a tang that goes into the hole in the face of the cam gear. #4 - Normal - holes are steam holes to allow air and gasses to purge into the head and out through the t-stat housing. 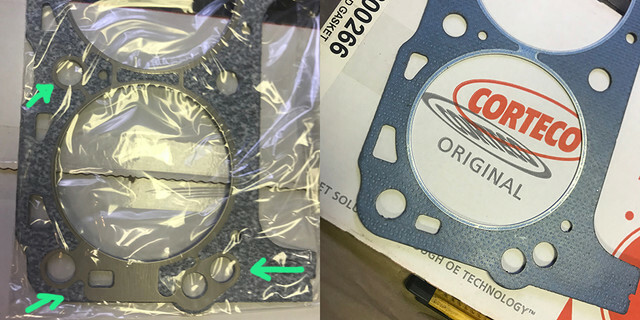 If there is an "UP" or "FRONT" stamp on the gasket, pay attention to that when installing the heads. #5 - Lifters don't sit square on the lobes, and the lobes are tapered to induce rotation. As far as the timing set, what is the manufacturer and model #? There are different sets depending upon the year and IIRC, one may not work with the other. #5 - Lifters don't sit square on the lobes, and the lobes are tapered to induce rotation. I think you need to flip the crank gear around. #2 yes, thats what i see on newer 385, but original one (and in my own reply) is perfectly flat and smooth, found n some forum, it was glued... how weird. #5 What do you mean? invert the gear orientation? It was already on this way (and markings to align are also visible). From the side, I don't think the shape would be work if rotated. I would try, if I could get that thing out in the first place. Do I need tap that retainer piece of metal like crazy to get it out? Is there a good trick to get it out? #2, because it can be placed in any orientation, it is not balanced by the cam. Whether or not you keep it is up to you. I would use blue thread locker on the back side of it to "glue" it to the cam sprocket if you do keep it. #5, if the timing/orientation marking is visible you likely have it on correctly. Edit: see below. Did you check the freeplay on the camshaft? 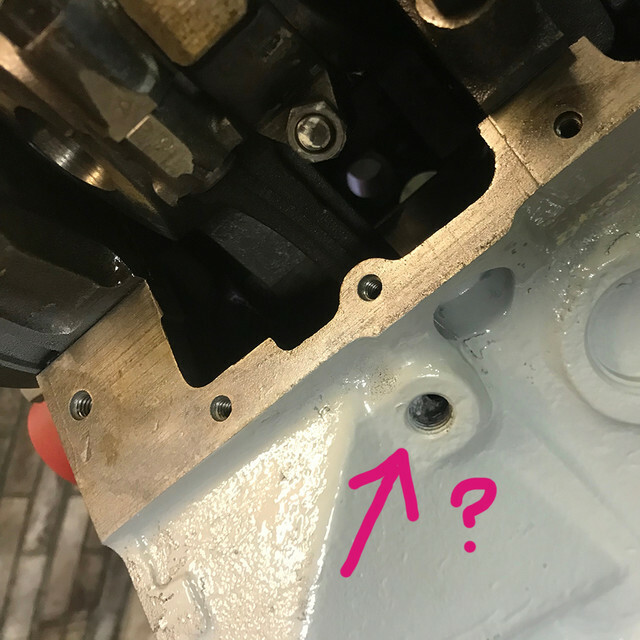 If it is good and the thrust plate is down all the way it should be OK. One thing to check, is if the cam bearing plug in the back of the block was installed too far in, that would keep the cam from going back as far as it should. If you decide to leave the fuel pump eccentric off you'll need to replace it with a hardened washer, at least a grade 8. 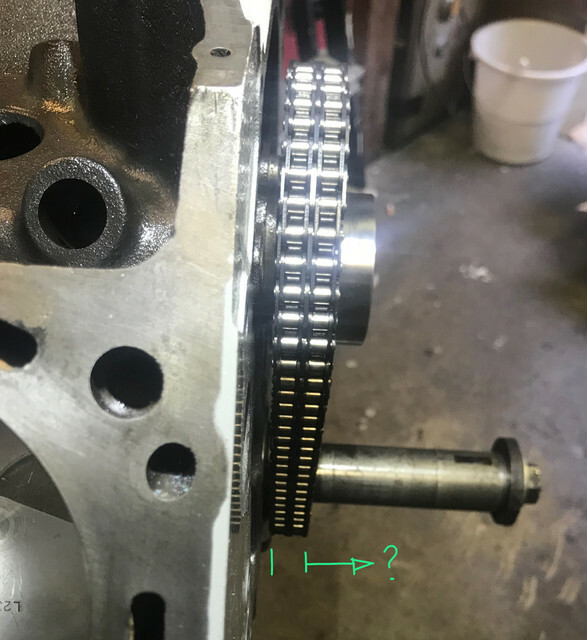 Edit: I looked at the pictures closer, and I think that Hemi might be right, I believe the crank sprocket is on backwards. That sprocket may have timing marks on both sides. I believe the raised portion next to the crankshaft should be facing inward, and the face of the sprocket that faces out should be smooth. That's exactly what I was thinking, the raised boss should face rearward - but I'm a Cleveland guy so take it FWIW. (08-18-2018, 04:59 PM)Don C Wrote: because it can be placed in any orientation, it is not balanced by the cam. Whether or not you keep it is up to you. I would use blue thread locker on the back side of it to "glue" it to the cam sprocket if you do keep it. if not, I need a washer. ok, crystal. But why such a strong one? What kind of stress is apply to it? The eccentric piece on itself is receiving only the side pressure of the fuel pump (if any) as a pump will not be reused, in my old brain, I thought a washer with the thickness of the old eccentric metal would then be there just to mimic the same potential traveling distance if the cam moves forwards at times. Being sandwiched with the cam bolt. Just wondering why it needs be that strong? I don't mind try to look now, I even tried but can't remove that metal lock thingy in front of it. How do you get it out? I tried tap with flat screwdriver and small hammer and it went a bit higher, but did not move after that and didn't want to damage it. Any tips on how to remove it if I need to remove it at all? (may be the gear can use it as a sort of rail, I dunno). For the gear on itself, I will need some puller that is long enough, the ones i have were too short for this engine. So if 1/2 way or less, I don't see if any marking then its correctly oriented. Correct? #2 because it has to hold the cam sprocket on. 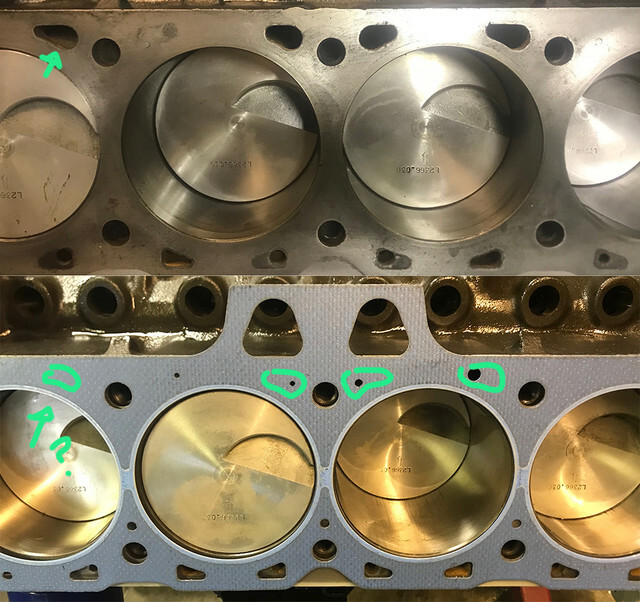 A regular soft washer can get what is called plastic deformation, which would allow the bolt to lose torque, come out with catastrophic results. The bolt that holds it on is at least a grade 8 bolt, the washer has to be the same strength. 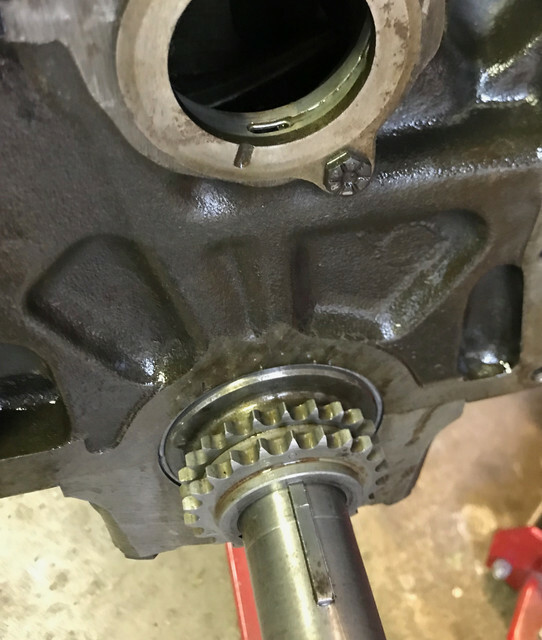 #5, that is the key, which is in the keyway, and it runs under the sprocket and is what keeps the sprocket in the correct orientation on the crankshaft and keeps it from turning on the crankshaft. You cannot remove it with the crank sprocket on. The sprocket has to be removed with a gear puller. Crank sprocket should slide right over that woodruff key. Tap it back down into the crank. The key is what drives the cam.